In 2004 Momofuko Noodle Bar opened in New York City by the Korean American chef David Chang. Over the years he has built a restaurant empire that rivals none. I personally adore him. His passion for food is limitless. He has taken his Mother’s traditional Korean recipes and jacked them up to a culinary extreme! In the January 12, 2012 NYT Sunday magazine section an article titled Bo Ssam Miracle appeared. Chef Chang turned traditional Bo Ssam int, well like the title say, a miracle. This is Patty Cook’s and my go to Bo Ssam recipe. Instead of Pork Belly he uses Pork Shoulder that is slowly roasted. So I have always assumed this was traditional Bo Ssam, until Maangchi enlightened me to the true Korean Bo Ssam. 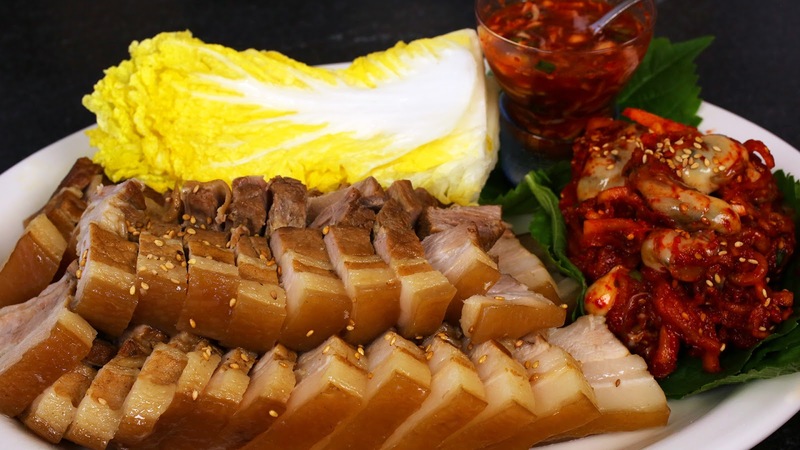 Bo Ssam is made with a cut of fresh pork called Pork Belly. This is what we make bacon out of. Super fatty and yummy! The dish is great for a party because it is served as a cold meat platter. The word Ssam in Korean means “wrapped”. When served the sliced pork is wrapped in a lettuce leaf with a little dab of dipping sauce and popped into your mouth. What even makes it more special is to add a shucked oyster if you like. Totally amazing! This recipe is so very easy so don’t be intimidated!! Place everything in a pot and cook over medium high heat for 2 hours. Remove the pork from the broth and let cool. Clean head of red leaf or bibb lettuce and separate the leaves. Arrange in a bowl.Head down to the Bellvale Market while the Pork Belly is cooling and have Steve shuck you up a dozen or two oysters. Then hurry homeand slice the cooled down pork into 1/8 -1/4 inch slices and arrange nicely on a platter.I have seen some recipes where you take the already cooked Pork Belly and slide it under a broiler to crisp up the fabulous skin, then slice. I haven’t tried this yet but it sure sounds great!If you’re into Bento Boxes, this dish is perfect.If you are a big fan of pork, give it a try. magazine section an article titled Bo Ssam Miracle appeared. Chef Chang turned traditional Bo Ssam int, well like the title say, a miracle. This is Patty Cook’s and my go to Bo Ssam recipe. Instead of Pork Belly he uses Pork Shoulder that is slowly roasted. So I have always assumed this was traditional Bo Ssam, until Maangchi enlightened me to the true Korean Bo Ssam. Clean head of red leaf or bibb lettuce and separate the leaves. Arrange in a bowl. Head down to the Bellvale Market while the Pork Belly is cooling and have Steve shuck you up a dozen or two oysters. Then hurry homeand slice the cooled down pork into 1/8 -1/4 inch slices and arrange nicely on a platter. I have seen some recipes where you take the already cooked Pork Belly and slide it under a broiler to crisp up the fabulous skin, then slice. I haven’t tried this yet but it sure sounds great! If you’re into Bento Boxes, this dish is perfect. If you are a big fan of pork, give it a try.